TORONTO (CNS) — Eighty-seven religious leaders, including Toronto Cardinal Thomas Collins, have united to call on the Canadian government to strike down a new policy that requires organizations seeking summer jobs grants to confirm support for the pro-abortion and gender policies of the Liberal Party. “The promise of a free and democratic society is that there be no religious or ideological test or conditions to receiving government benefit or protection,” said a Jan. 25 statement signed by Christian, Jewish and Muslim leaders. 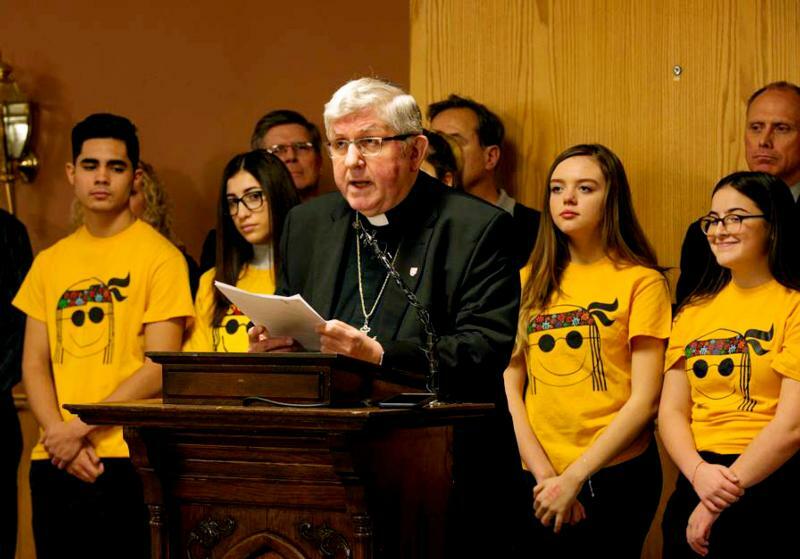 Cardinal Collins, speaking on behalf of Canada’s Catholic bishops, said religious groups want to continue working with the government on a program that provides funding to hire students to work at a wide range of small business, church and charitable organizations during the summer. Employment Minister Patty Hajdu told an Ottawa news conference later the same day her government has no intention of removing the attestation or changing the wording to address the concerns of the religious leaders. She continued to stress the government would refuse to fund any organization that, in her opinion, disputes a woman’s right to abortion as part of the organization’s core mandate. The issue arose last summer when pro-abortion groups protested that some grants from the $220 million Canada Summer Jobs program were going to pro-life organizations, whose activities included distributing graphic anti-abortion pamphlets. In response, the government changed the rules this year. Applicants must now sign an attestation that many interpret as being nothing more than a blanket approval of the government’s abortion and gender identity policies. Hajdu said the purpose of the change is not to deny religious and charitable organizations access to funding, but to ensure that funding “should never go to pay for work that seeks to remove Canadian rights — like a woman’s right to choose, or LGBTQ2 rights.” Canadian law permits abortion at any time during a pregnancy. Cardinal Collins said he is convinced the government did not intend to upset such a wide swath of religious Canadians. “If the government has a problem with a particular group doing something they disagree with, they should talk to those groups,” the cardinal said. “The handing out of graphic anti-abortion material is very troubling, I know. In an attempt to quell the growing criticism of the funding policy, Hajdu made personal phone calls Jan. 22-23 to a number of organizations, including the Canadian Conference of Catholic Bishops, and added a supplementary guide to define what is meant by “core mandate.” As long as an organization’s “primary activities” do not include pro-life advocacy or discrimination against minorities, an application will be accepted, she said. However, the applicant still must check a box to attest general support of the government’s abortion and gender policies. Rabbi Chaim Strauchler emphasized how troubling it is for Jews to see the government impose an ideological or values test on any minority. “We have been a minority throughout history. We are very sensitive to the possibility of the majority trying to impose values, even if we agree with those values … (forcing people) to believe or to act in a certain way not in accord with their basic values,” Rabbi Strauchler said. St. Benedict Parish is home to a summer day camp in a neighborhood with many low-income families. Natalia Opara, now in grade 10, has been a camp counselor there for two years, following eight years as a camper. “It feels like a family when I walk through the door. I only get to see some of these people one month every year,” said Opara. Opara said she worries about the families who might be denied an affordable summer camp this July. “It feels pretty good to help some of the families,” Opara said. Bruce Clemenger, president of the Evangelical Fellowship of Canada, said more than 1,500 Evangelical projects have received government funding in the past. “The government has placed us in an untenable position,” he said. “We’re worried about the future, not just now,” said Imam Refaat Mohamed of the Canadian Council of Imams. Ideological tests, if allowed, could be used in other ways if it is permitted for this issue, said Mohamed. “We love the differences we have in Canada. We are very proud of who we are. We are really proud of who we are. And we should always respect those with different beliefs,” Mohamed said. Contributing to this story was Deborah Gyapong in Ottawa. Swan is associate editor of The Catholic Register, Toronto. Gyapong is Ottawa reporter for Canadian Catholic News.